Enjoy the Music.TV live streaming venture connects music creators and equipment manufactures to millions of music enthusiasts worldwide. (November 26, 2013) Enjoy the Music.com, high fidelity audio's leading online information site for more than 18 years and now in concert with major print media plus Internet partners, is pleased to announce a historic alliance. Armed with a new state-of-the-art audio/video studio facility, Enjoy the Music.TV will stream key information to help educate consumers about great high fidelity audio gear while also showcasing multi-Grammy award winning recording studio engineers and musicians, EDM DJs plus home, car and portable audio gear. It is not just how music is created in the studio or reproduced with an electronic device, what matters most is that the musical artists' creation is experienced as intended in true high fidelity audio sound quality. With so many new technologies reaching the marketplace, it can get confusing to exactly what the inherent sound quality of music people are purchasing. Consumers can rely on Enjoy the Music.TV's experts, with many hundreds of years of experience in the field of music and audio, to educate as well as entertain our audience. With technology now moving at such a rapid pace, it may be confusing for music enthusiasts to understand all the possibilities and benefits of MP3 versus, vinyl LPs, DSD, DVD-A, SACD, 24-bit/192kHz, etc music files and how high fidelity equipment provides ease of use and plays music files within their daily lives. Equally as confusing may be all the new gear now reaching stores worldwide. Enjoy the Music.TV will make life easier as we demystify acronyms, introduce popular musicians, recording studio engineers, popular personalities plus well-established journalists who report on the industry. Together, we work in harmony to enhance how we all interact with music on a daily basis and bring it to a higher level. Since music plays an important part in our lives, with billions of dollars spent each year worldwide to create, deliver and reproduce it, consumer are always looking to make their music easier to access and in finding ways it can enhance and integrate within their lifestyle. With over a dozen leading magazines and sites as partners at launch, plus five major consumer electronics shows that focus on high fidelity music and equipment, Enjoy the Music.TV will continue to expand their reach and seek strategic alliances with those who play key roles within the many facets of the music industry. Viewers can participate and interact during live events via chat, send in their photos for our broadcast to show how they enjoy music and much more. Enjoy the Music.TV brings a new level of connectivity with our audience and to those who create music. "With the launch of Enjoy the Music.TV and its ability to reach a worldwide audience, we are enabling music enthusiasts to better connect to their music and with those who created it," said Editor and Creative Director of Enjoy the Music.com and Enjoy the Music.TV Steven R. Rochlin. "Today, there are so many ways to enjoy music that was not possible only a handful of years ago. Enjoy the Music.TV is simply an evolution in the many technologies Enjoy the Music.com has employed over the years. With our in-house based state-of-the-art professional studio, plus the ability to mobilize for on-location reporting, this opens up yet another venue to promote the many facets of the music industry. Our guiding motto for the past 18 years has always been to help educate others and enable them to appreciate their music to its maximum potential; as the artist intended to convey to their passionate audience. To be true to your music. Or, put simply, enjoy the music." Enjoy the Music.com is the Internet's undisputed industry leading information site for high fidelity audio information, reviews and show reports including home and mobile devices, digital music downloads and more since 1995. The site has received critical acclaim worldwide with like-minded audio publications both in print and online plus the President of the Consumer Electronics Association. Being affiliated with seven prominent print publications, plus offering its own Review Magazine and over 160 show reports online, Enjoy the Music.com is the leading Internet authority for diverse information serving music lovers worldwide. Enjoy the Music.TV adds an additional seven online publications as partners plus both sites are media sponsors of high fidelity audio events including AXPONA, California Audio Show, TAVES, T.H.E. Show Newport Beach and the Rocky Mountain Audio Fest. Enjoy the Music.com is the only specialty audio site with its own Internet browser, RSS feed, Android and Windows Phone 7 / Windows 8 applications so their readership can easily find information they desire. Music enthusiasts can find us on all leading social media sites including Instagram, Facebook, Pinterest and Twitter. Enjoy the Music.com is official Internet partners with The Absolute Sound, Australian Hi-Fi Magazine, CANADA HiFi, Hi-Fi+, Hi-Fi Media, Hi-Fi World, HIFICRITIC, and legacy publications Sound Practices and VALVE magazine. Enjoy the Music.TV adds Internet partners Audio360.org, Dagogo, High-Fidelity, Mono & Stereo, Part-Time Audiophile, and Positive Feedback Online. "AXPONA 2014 is very pleased to be the launching pad for the new site Enjoy the Music.TV from Steven R. Rochlin," said Stephen Davis, VP Sales & Industry Relations of the AXPONA event. "Enjoy the Music.com has always produced high quality reporting and coverage that was and still remains to this day far ahead of its time. With the launch of Enjoy the Music.TV, it will no doubt be the site to watch for coverage of all things related to our great industry. AXPONA is overjoyed to have this new site streaming full coverage of new and innovative events plus their addition to the AXPONA 2014 event." "Steven R. Rochlin is always pushing for inclusion and innovating around his desire to reach beyond the already converted," said Michael Mercer of Audio360.org. "We were honored to take part in his live streaming via the Enjoy the Music.com Dub Bot from RMAF 2013, and Enjoy the Music.TV only shows he's one of the very few who truly puts his money where his mouth is when it comes to outreach! We're psyched to be affiliated with Enjoy the Music.TV and we look forward to helping make the channel the best it can be. With Steven at the helm we know we're in for informative and entertaining content!" "Mono & Stereo high fidelity audio magazine is happy to join the forces with Enjoy the Music.TV for a long term collaboration with exclusive content," said Matej Isak, Founder and Editor-In-Chief of Mono & Stereo. "In the era of globalization and borderless audio, viewers from all over the world are seeking quality content that ensure the true insights into the products and people behind them. Mono & Stereo and Enjoy the Music.TV will bring the passion and quality content to a large audience." "As the high fidelity audio and music industry evolves and market demographics shift, it is clear that new approaches are required," said Scot Hull, publisher of Part-Time Audiophile. "We have to both evangelize the joys of music appreciation to the forgotten generations while making it easy and fun for those on the path to find the innovators that are carrying the high-end audio industry forward. There are a lot of folks out there that would love to explore 'better sound', but the message of how to do that hasn't reached them. Leveraging new approaches and new media seems an obvious great step. Part-Time Audiophile believes that the journey is at least as important as the destination. You have to do more, speak the language, and deliver in a way that consumers will enjoy and actively seek out. Enjoy The Music.com has been at the forefront of the fight for audio joy, we’re quite sure this new venture will be an entertaining and informative addition to the arsenal of tools the curious will use to pursue their own path. We’re thrilled to support it." 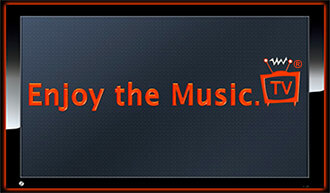 "Positive Feedback Online is pleased to affiliate itself with Enjoy the Music.TV," said Editors Dr. David W. Robinson. Myself and co-Editor Dave Clark see this as an excellent opportunity to extend our audio community into new modes and venues, as we extend our reach to passionate audio and music lovers globally. We agree with Steven R. Rochlin that the time has come for high fidelity audio to reach out globally via streaming video. There are hundreds of thousands of music enthusiasts who will benefit from high-quality media sent out over the Internet. Positive Feedback Online's 24-year-old model of being a 'creative community for the audio arts' will fit in very well with Enjoy the Music.TV's commitment to outreach via excellent video production and Internet-based streaming media. We look forward to a successful collaboration." "We at Dagogo and California Audio Show are excited to be partners with Steven R. Rochlin's launch of Enjoy the Music.TV channel," said Constantine Soo, Editor of Dagogo and President of the California Audio Show. Steven is a visionary of our time and we look forward to working with him closely." "High-Fidelity.com is pleased to announce that it will be joining Enjoy the Music.TV and Steven R. Rochlin as he once again seeks to push boundaries, open new doors, and seek new vistas for our shared audiophile enthusiasm," said High-Fidelity.com co-founder Chris Sommovigo. "I've known Steven for over 20 years and I've never known him to be timid about a great idea. His generosity and goodwill precede him, and we're very happy to have been asked aboard Enjoy the Music.TV." "We wish everyone with Enjoy the Music.TV well with the new venture," said Richard Beers, President of T.H.E. Shows Las Vegas & Newport. "It sounds extremely exciting and if anyone can pull it off, it is Enjoy The Music.com and Enjoy the Music.TV! We here at T.H.E. Shows Las Vegas and Newport have attempted our darnedest to attractive a new 'listening audience' and folks who appreciate all the latest developments in high-end audio. We look forward to working with Enjoy the Music.TV on this new project. No one keeps up with media advances like Steven R. Rochlin. Can’t wait to see what’s next!" "HIFiMedia is very excited to become a part of Enjoy the Music.TV, a new effort by Steven R. Rochlin," said Andrija Curkovic, Editor-in-Chief of HiFi Media. "We expect Enjoy the Music.TV and its affiliates to find its way to broader public and audio and music lovers. This approach open new windows of opportunities and may prove particularly useful for small markets such ours." "Rocky Mountain Audio Fest is delighted to join Enjoy the Music.TV in celebrating the introduction of a new technological advancement," said Show Director Marjorie Baumert. "I can always count on Steven R. Rochlin to bring groundbreaking toys to RMAF. At our 2013 RMAF event he introduced the Dub Bot and there are plenty of YouTube videos that recorded the surprise! I heard from people all over the world about how much they enjoyed the videos and especially the live interactive demo in the CANJAM room. At RMAF 2014, Enjoy the Music.TV will be here at the Rocky Mountain Audio Fest transmitting a full day so everyone can enjoy the new products and interviews of the cast of characters within this industry. Please join me in congratulating Enjoy the Music.TV's launch and a creative avenue to reach a larger audience."